Savi Property is registered with the Royal Institution of Chartered Surveyors, the proprietor being a Chartered Surveyor since 1994. We manage a large portfolio of properties (both Residential & Commercial) for our valued clients. We are a letting & managing agent who advertise available properties via our online database. We also advertise via www.rightmove.co.uk, the market leader in the UK. Savi Property takes great pride in offering a professional service which includes a strong commitment to personal care and value for money. Once registered, we notify you of any suitable properties by email or phone. We offer a Friendly, professional and helpful service. Please feel free to call any time for further information. We specialise on the Wirral peninsular. Our fees are extremely competitive. Do you have property that you would like us to Manage? Savi Property offers a professional Management and Maintenance Service for Landlords throughout Wirral. Savi Property was established in 2003 with its head office based in Hoylake, Wirral. The Proprietor of Savi Property actively works in the business to provide a dependable service, second to none. Education: St Anselms College Birkenhead Graduated from Sheffield Hallam University in 1991 with an honours degree in Urban Land Economics. 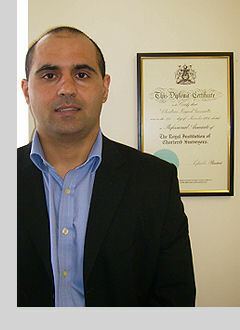 Qualified as a member of the Royal Institution of Chartered Surveyors in 1994.